The dots on this adaptation of an early Albany map represent the house addresses of the "free people of Color" listed in the Albany City Directory for 1815. 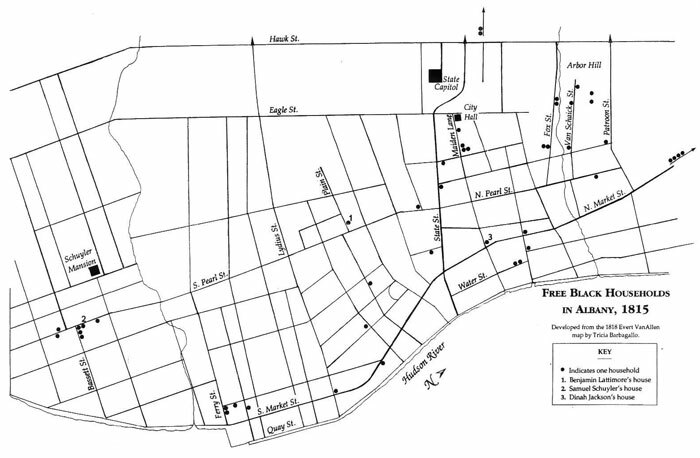 Note the settlement clusters around Captain Samuel Schuyler's house on South Pearl Street, at the ferry, along upper Maiden Lane, and up Foxes Creek! The historic map used here was made by city engineer Evert Van Allen in 1818. It was adapted for use in "The Jacksons, the Lattimores, and the Schuylers" article by Tricia Barbagallo. The dots represent the householders identified as "free people of color" in the City Directory for 1815. The four dots and arrow along North Market Street refer to householders in what formerly was Watervliet!